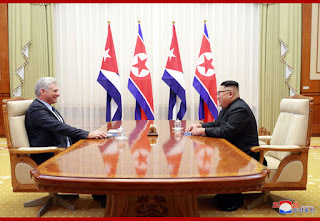 Pyongyang, November 5 (KCNA) -- Kim Jong Un, chairman of the Workers' Party of Korea and chairman of the State Affairs Commission of the DPRK, had talks with Miguel Mario Diaz-Canel Bermudez, president of the Council of State and president of the Council of Ministers of the Republic of Cuba, on Sunday afternoon. Supreme Leader of the Party, state and army Kim Jong Un and his wife Ri Sol Ju met the Cuban president and his wife outside the talks room of the Paekhwawon State Guest House in a warm atmosphere, exchanged greetings with their hands held each other and had a souvenir photo taken. Then, there was a tete-a-tete between Kim Jong Un and Miguel Mario Diaz-Canel Bermudez. 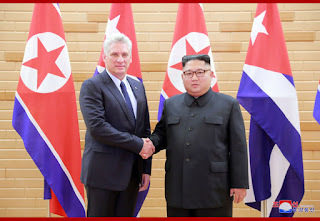 Warmly welcoming the visit to the DPRK by Miguel Mario Diaz-Canel Bermudez, president of the Council of State and president of the Council of Ministers of the Republic of Cuba, Kim Jong Un said that the current visit of the delegation would offer an occasion for demonstrating the invincibility of the traditional fellowship, trust, friendship and solidarity of the peoples of the two countries and serve as a manifestation of support and solidarity to the Korean people's just cause. 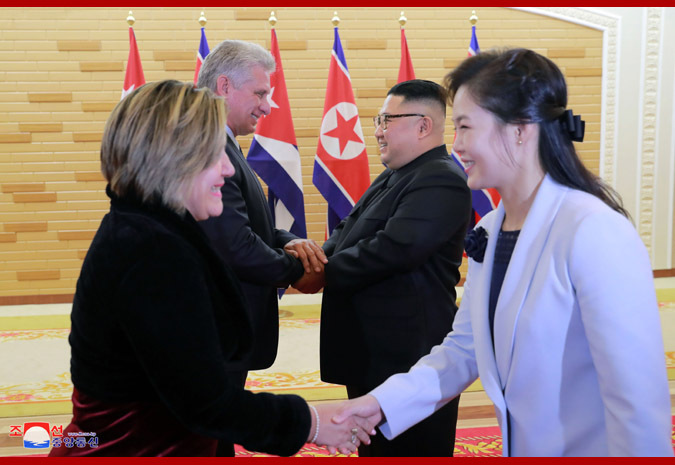 Noting that he was deeply moved to receive the warm hospitality and enthusiastic welcome by Kim Jong Un, the Korean Party and government and Pyongyang citizens, the Cuban president said that the Cuban party, government and people were pleased to see the Korean people invariably advancing along the road chosen by themselves and making a rapid development under the leadership of Kim Jong Un. 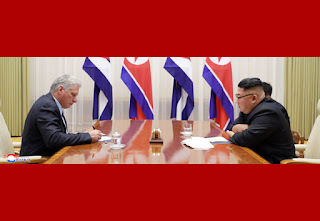 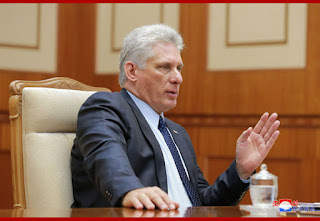 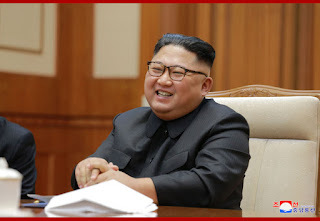 Kim Jong Un and Miguel Mario Diaz-Canel Bermudez informed each other of the achievements and experiences gained in the party and state activities of their countries for building socialism to suit to the specific conditions of each country and expressed full support and solidarity with each other. 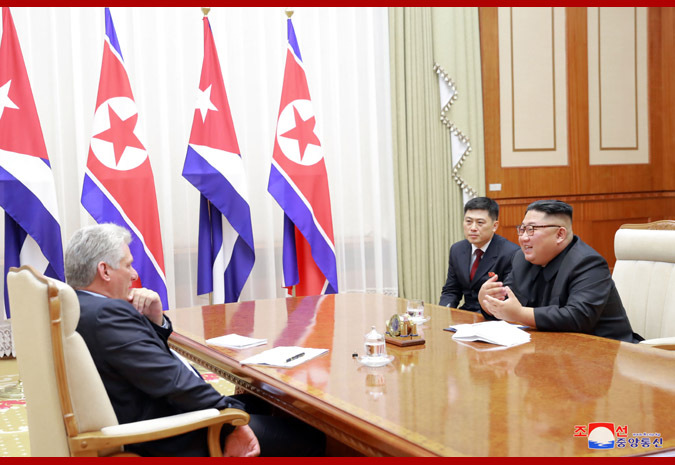 They discussed the issue of further expanding and developing cooperation and exchanges in various fields including economy, culture, public health, science and technology to meet common interests. 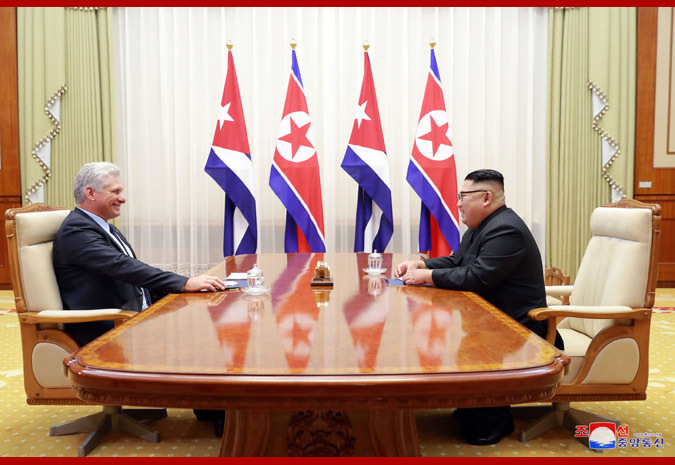 There was an in-depth exchange of views on the crucial issues of common concern of the WPK and the Communist Party of Cuba and on the international situation and a consensus of views on all issues was reached at the talks. Kim Jong Un and Miguel Mario Diaz-Canel Bermudez highly appreciated that the great leaders of the two countries provided and developed the framework of the special friendship based on revolutionary principle, comradely obligation and socialist principle and that the history and tradition of friendship between the two countries have been invariably carried forward and further developed under the new situation and environment thanks to the joint efforts of both sides. They expressed the firm stand and will of the parties and governments of the two countries to further expand and strengthen the strategic and comradely relations of friendship and cooperation between the two parties and the two countries in line with the requirements of the new era in the future, too.